Today's post is an all-products edition of News & Notes, but I first wanted to thank the National Foundation for Celiac Awareness and its campaign to make gluten-free pizza available at schools nationwide. As a result of this effort, I contacted our school district's food-service provider to see if it could order the gluten-free pizza for our son's elementary school. It took some time, but I learned earlier this week that the pizza would be available in time for the weekly "pizza day" in the cafeteria. It made my night when I came home from work on Wednesday and my son told me that he felt "normal" to have to wait in line with his friends and get lunch on a tray like other students. For more on Schwan's food-service gluten-free pizza, visit the company's website and share the information with your own child's school. On Tuesday, I posted a review of a recent meal at the Rainforest Cafe in Atlantic City. The Ravitz ShopRites in southern New Jersey, particularly those in Marlton and Cherry Hill East, have greatly expanded their gluten-free sections. 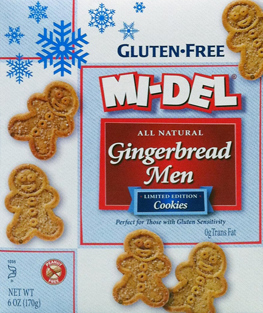 New to those stores are Mi-Del Gingerbread Men cookies and Glutino's new Genius bread. The Genius bread, in White and Multigrain varieties, features full-size slices. Wynnewood's Main Line Baking Company has lined up more stores to sell its gluten-free products, including the Marlton ShopRite and Whole Foods in Wynnewood. During a recent trip to Water to Go in Pennsauken, my wife discovered Russo's mozzarella sticks (delicious! ), Kim & Scott's Bavarian soft pretzels (meh), and Joan's calzones (haven't tried yet). Lots of new products were announced at the Expo East natural-products food show in Baltimore last weekend. Erin at Gluten Free Fun reported that Udi's will debut gluten-free muffin tops and three kinds of frozen pizza in January 2012. Gluten Free Living tweeted from Expo East that Feel Good Foods will soon offer gluten-free egg rolls to complement its dumplings, while Sandra at the Gluten Free Optimist blog reported that the egg rolls will come in chicken, shrimp and vegetable varieties. I'll totally have to check out those GF mozzarella sticks! I miss them...they're an occassional (aka very rare) treat anymore. I tried the muffin tops at Udi's booth at Expo East and they were actually very good and moist!